Buy Industrial shop curtains,Warehouse Separation Curtains,PVC Strip Curtains,Heavy Duty Industrial Curtains,Plastic Welding Curtains in cheap range at AKON Curtain and Divider. AKON Curtain and Divider is the Best Curtain Selling company in USA which is located near Fernandina Beach. 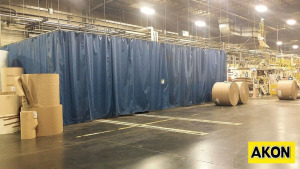 To Buy Curtains for your industry or warehouse for temporary separation, Industrial Curtains are available in Bulk with Customization Availability. Contact us for quick Assistance and Guidance regarding curtain purchase.we will definitely help you.